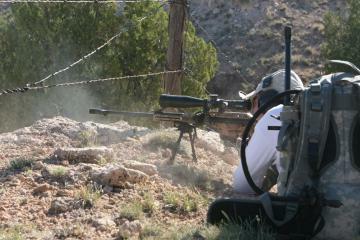 Under tight time constraints, this shooter engages a final target. To save time, it's important to have the necessary gear accessible (pack in foreground). Dave Wheeler's Blue Steel Ranch property is located at 4000' altitude, populated with scrub brush and riddled with gullies and great sweeping ridge lines, which provides fantastic locations for both shoot positions and tricky target placement. While the travel time from station to station is not timed, the rough, steep terrain and often-brutal weather tax the shooter physically. Temperatures between 90 and 100 degrees are common. This year the winds were brutal with 15 mph gusting to 35 mph, and the temperatures were taxing at 95 - 100 F.
The stage procedure proscribed that shooters come to each station blind, with no notion of where the targets will be located. The range officer (RO) read the written brief from the stage description, and then the shooter had five minutes to locate the targets, identify them to the RO, do range estimation, dope the wind, and make the shot. Each target gets one shot, and that's it-- no alibis, no sighters. The shooter earns one point for each target located and identified, one point for each normal target hit, and three point for each bonus target hit. 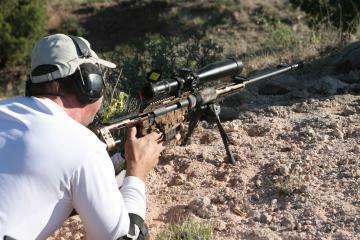 Many of the stages require some movement to re-engage the same targets again after moving up to ten yards from the original shoot position. Targets on the field courses were generally six or twelve inches across, and were placed as far as 700 yards. I didn't get to shoot the Steel Safari as a competitor this year, although I did "shoot in" both field courses the preceeding Wednesday- it was a long day. It is common practice for match staff to "shoot in" stages while finalizes the stage setups. The purpose is to find any final problems with shoot positions, target positions, terrain or organic features, and correct them to ensure safety and that each competitor has a fair challenge. Since I wasn't shooting for score and to save my "good" ammunition, I shot my .308. Here's a brief overview of my setup. Accuracy International AW in .308 with a S&B PMII 3-12x50 mm scope, AI bipod, and Thunder Beast Arms model 30P sound suppressor. I use the Swarovski Laser Guide range-finder and typically get by without using binoculars (if I need them, I have a set of Leica Ultravids). 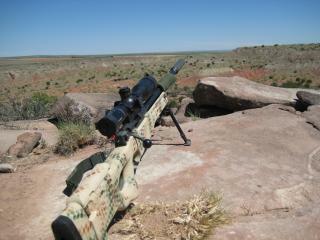 In .308, I shoot the 155 Lapua Scenar. The competition rifle I used at the 2006 and 2007 Steel Safari matches is the exact same rifle, but set up in .260 Remington and shooting the 139gr Lapua Scenars. This year the wind conditions were extremely difficult. News reports claimed that the Logan area was getting more wind than it had in decades. Shooters come to expect five to fifteen mph winds, but constant 15 gusting to 35 mph is much more difficult. Temperatures hovered around 100 degrees which combined with the wind for afternoons that felt like standing in front of an open oven. The heat made the match a lot more physically difficult, and the wind made it a lot harder to make hits. This Tubb 2000 rifle had a reliability problem early on the first day of the field courses. The shooter was able to rectify the problem, but wasted over a minute of precious time. The match also tests gear. Over the course of the match, rifles just keep getting dirtier and the wind blows fine dust and sand just about everywhere. This tests the reliability of rifles and other gear in field conditions, and some rifles built for "match" use started to choke on Saturday.